So you want a dead compact PC that will fit nicely into any environment, but still has enough grunt to power VR gaming? Then meet the VivoPC X, a neat little computer which has plenty enough horsepower thanks to the Kaby Lake processor and Pascal graphics under the bonnet. Asus unveiled this machine over at CES in Las Vegas, and it comes with an Intel Core i5-7300HQ processor paired with a GeForce GTX 1060 VR-ready graphics card, along with 8GB of 2133MHz DDR4 system memory. For storage, there’s a 512GB M.2 SATA SSD, along with an up to 2TB spinning hard drive for extra capacity. Connectivity-wise, you get four USB 3.1 (Gen 1) ports along with a pair of USB 2.0, plus a DisplayPort and two HDMI ports. All of this in a compact little 5-liter case which means the device can sit next to your living room TV without looking clunky or out of place. The VivoPC X is due out in March and will be priced at $799 (around £650). 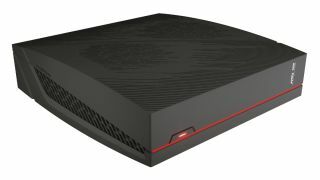 At the big Consumer Electronics Show, Asus also revealed that it has updated the GT51CH gaming PC to feature a Kaby Lake processor. The rig now comes equipped with an Intel Core i7-7700K engine – which can be overclocked to 4.8GHz – backed up with twin GTX 1080 graphics cards in SLI (or you can drop down to a GTX 1070 for a more affordable machine). The twin GTX 1080 beast performed no less than 60% faster than a GTX 980 SLI system, according to testing carried out by Asus, with the company also noting that the GT51CH could run Watch Dogs 2 on ‘ultra’ settings with an average frame rate of 66 fps. Smooth enough, in other words. You can also specify the machine with up to 64GB system memory, a 256GB M.2 SSD and up to a 3TB spinning disk for storage. Pricing hasn’t yet been announced, but you can expect this gaming PC to arrive at some point in the second quarter.